이 불화는 17세기말에서 18세기 초 팔공산 일대에서 활발한 활동을 펼친 의균의 제자인 쾌민과 체준 등이 함께 1724년에 제작한 영산회상도로서 중앙의 석가모니불을 중심으로 보살과 제자, 호법신 등이 빽빽하게 둘러싸는 전형적인 군도형식을 보여주고 있다. 본존의 키형 광배와 뾰족한 육계표현, 양감 있는 인물표현, 중후한 사천왕의 신체표현 등은 스승인 의균이 제작한 기림사 비로자나삼불회도와 유사한 특징을 보여주고 있어 스승의 양식을 잘 계승하고 있다. 그러면서도 색채에서 적색과 녹색의 강한 대조를 이루는 색채감이나 권속이 본존을 빽빽하게 둘러싼 구성 등은 의균과는 다른 특징을 보여주고 있으며, 이와 같은 화풍적 특징은 1728년 이후 불화 화풍을 주도하고 있다는데서 더욱 큰 학술적 의미가 있다고 판단된다. 또한 이 불화는 화기뿐만 아니라 발원문을 비롯하여 후령통 등 격식을 제대로 갖춘 복장주머니(腹藏囊)도 가지고 있어 불화 제작의 상황을 짐작하는데 더 없이 중요한 정보를 제공하고 있다. This Buddhist painting, dating from 1724, is by Kwaemin and Chejun. Kwaemin was a disciple of Uigyun, a monk painter of renown who was active between the late 17th century and the early 18th century in the Palgongsan Mountain area. It depicts the scene of Sakyamuni Buddha’s sermon on Vulture Peak in a typical style of a painting featuring a large Buddhist pantheon. 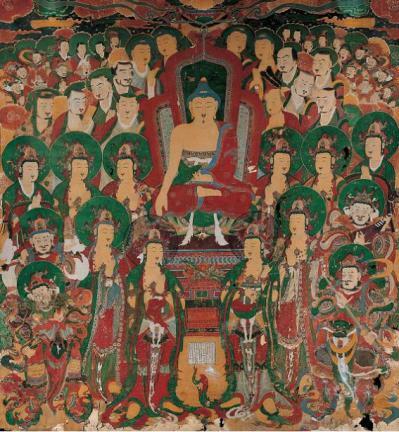 The painting is crowded with a large cohort of Bodhisattvas, disciples and Divine Guardians of the Dharma, surrounding Sakyamuni Buddha in the middle. The main Buddha has a tall rectangular-shaped halo around his head and a pointed ushnisha on top of the head. The figures are depicted in such a way as to convey a strong feeling of volume and depth. The way the bodies of the Four Guardian Kings are depicted, in particular, is reminiscent of the Painting of Vairocana Buddha Triad preaching to the assembly in Girimsa Temple, painted by Kwaemin’s mentor, Uigyun. At the same time, the use of colors, notably the sharply contrasting combination of red and green, and the composition, in which the painting is densely packed with the retinue of the main Buddha, are two aspects which distinguish Kwaemin from his teacher. These characteristics, insofar as they were part of a leading trend in Buddhist paintings, seen starting in 1728, add further significance to this work. The painting, furthermore, has not only a postscript and a prayer text, but is also accompanied by a votive object pouch, appropriately furnished with a container; all these provide priceless information on the circumstances of its creation.